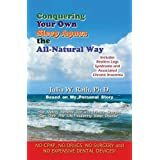 Author Julia W. Rath is interviewed about her book Conquering Your Own Sleep Apnea the All-Natural Way. *SKOKIE includes Arlington Heights, Bartlett, Des Plaines,Glenview, Golf, Hanover Park, Mt. Prospect, Northbrook,Park Ridge, Prospect Heights, Schaumburg, Streamwood,Wheeling. *SKOKIE includes Buffalo Grove, Elk Grove Village, Hoffman Estates, Inverness, Lincolnwood, Maine Township, Morton Grove, New Trier Township, Niles, Northfield, Northfield Township, Palatine, Rolling Meadows, Wilmette. The Skokie Public Library has been generous enough to invite Julia W. Rath, Ph.D., to address an audience made up of senior citizens and other interested members of the community. In her remarks, she will talk about all-natural approaches to managing sleep apnea and related sleep disorders. She will also be selling and signing her book Conquering Your Own Sleep Apnea The All-Natural Way. To be held in the Mary Radmacher Meeting Room off the East Entrance to the library, located next to the Auditorium. It was a success, thanks to having such an interested and attentive audience!!!! Having trouble sleeping? Come and listen to Julia W. Rath, Ph.D., as she explains how she conquered her own sleep apnea and related sleep disorders. Discover how you can best deal with your own illness–or that of a loved one–using her all-natural, self-help approach. Now she wants to share her “secrets” with you. Her book (which she will be selling and signing that evening) explains what you can do to take your life back. There are no guarantees in life. But this book should provide many people with some needed and lasting relief. Julia W. Rath will discuss her book and sign copies. LIMITED TO MEMBERS OF THE ROTARY CLUB, SKOKIE CHAPTER ONLY! LIMITED TO MEMBERS OF THE ROTARY CLUB, CHICAGO-O’HARE CHAPTER ONLY! An excellent turn-out of men and women for dinner and the presentation. LIMITED TO MEMBERS OF THE ROTARY CLUB, LaGRANGE CHAPTER ONLY!